The start of our Record of the Year countdown begins with the first instalment of our longlist. This first instalment starts at 42 to 32, with three more instalments to come every Friday of December at 7pm! 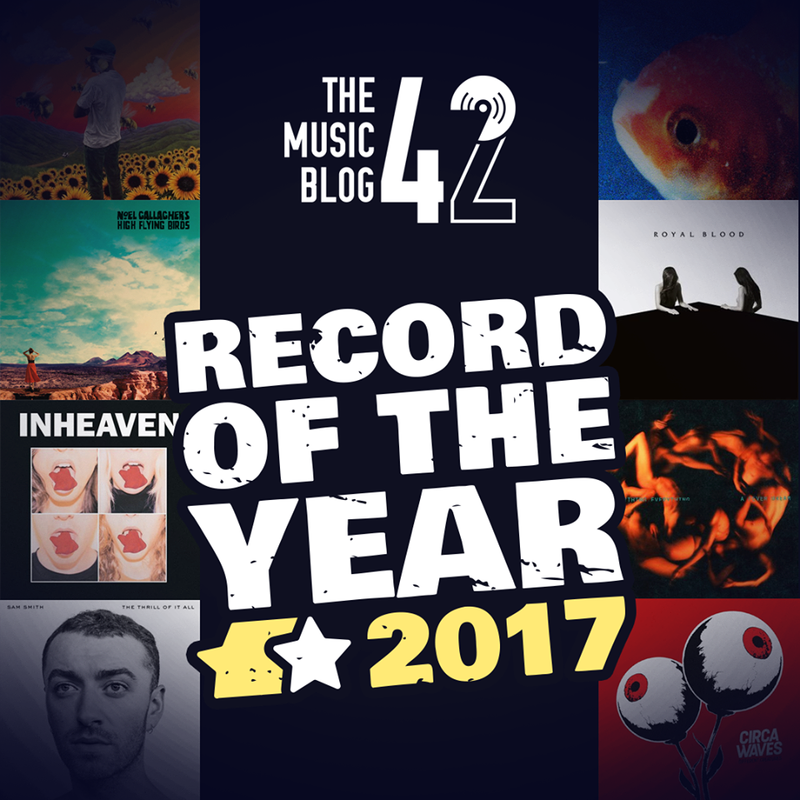 One of Britain’s upcoming rock bands produced a great debut record this year proving that INHEAVEN are without a doubt a band to watch in the coming years. Their ability to craft great rock songs was showcased on their self-titled debut with absolutely thumping tracks like Vultures and World On Fire, however, the best track on the record is the reflective, anthemic Regeneration. When we reviewed this in November, we described this record as ‘an outpouring of emotion’, and my god, it is. A great selection of songs includingÂ Say It First which has a great relaxing guitar line running through it, and the heart-warming break-up balladÂ Midnight Train. What made us like this record so much was Smith’s evolution as an artist, combining gospel elements into tracks like No Good At Goodbyes and R’n’B influences into songs including Pray. The album that British guitar music has been crying out for. One of the biggest bands in the UK truly delivered this year, going back to their roots making quality indie rock tunes. For Crying Out Loud heralded a new era for the band, with heavy influences from bands like The Stone Roses in songs like Are You Looking For Action? and the incredibly awesome Bless This Acid House. Their best record since West Ryder Pauper Lunatic Asylum. The album that British guitar music has been crying out for, part two! One of the strongest indie debuts of the year cemented The Amazons as a band on the rise, with their intelligent riffs winning fans over at their gigs and festival slots over 2017. Black Magic and Ultraviolet have been staples on British mainstream radio stations since the record’s release in May. Possibly one of the most surprising changes in musical genres you’ll see for a while. Paramore, once known for making punchy pop-punk bangers, are now creating superb electro-pop tracks like the depressingly upbeat Hard Times and the toe-tapping Told You So. A change in direction has worked wonders for the band, leading to increasing popularity from new fans. Their next album will be huge. Beautiful, intelligent and enlightening are three words which can describe Pure Comedy. Father John Misty’s third record showcases his supernatural ability of being a lyrical genius, alongside his masterful production filled with gospel swirls and acoustic melodies. Not much has changed musically, but songs like Ballad of a Dying Man and Total Entertainment Forever proves this is him at his best. One of Britain’s best solo artists, Rag’n’Bone Man came of age this year with a hearty, emotional record. The title track Human is easily his most recognisable track, however there are some other great tracks throughout. The incredible Bitter End and emotionally charged Skin brings out the best in his raspy, roaring vocals. A real talent who has the world at his feet. On This Old Dog, we see a completely different side to DeMarco than what we’ve seen on his previous two records. We have more broader musical ideas, but also really mature songwriting about his troubles in life as seen on My Old Man and Watching Him Fade Away about his ill father. Something different from DeMarco, but his music is still as loveable and endearing as ever. The first QOTSA album that includes no features, after collaborations with the likes of Elton John and Alex Turner (of Arctic Monkeys fame) on previous projects, is an enigmatic thrill ride. With Mark Ronson at the helm as producer, the tracks on this record have a groove-like feel to them, with the track The Way You Used To the main highlight of all of them. Josh Homme just gets better and better. Off the back of 2015’s Young Chasers is the bold, heavier follow up Different Creatures filled to the brim with indie bangers. Highlights from their second record include the pulsating Fire That Burns and the refugee-inspired track Different Creatures. Out On My Own, detailing front man Kieran Shudall’s friend’s battles with mental illness shows a serious side to their songwriting on what is one of the cohesive records of the year. The next instalment of our Record of the Year, counting down from 30-21 is out next Friday 8th December at 7pm!